This is my landlady, MsStopYourNoise's 10 month old grand niece in her Halloween costume - dressed up as Minnie Mouse. When she showed me this picture I just had to take a picture of it. What got me was how her costume was complete with Minnie's signature yellow shoes. Can we talk about the shoes for a minute? When I was a little girl, Minnie Mouse was a huge part of my cartoon world. I'd often look at her in her red and white polka dotted dress and then the shoes and think: I don't think those yellow shoes go with that dress. Where's the yellow in the dress? Interesting how I aware of colour co-ordination back then. 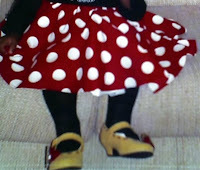 But I do remember scrutinizing Minnie's yellow shoes, noting the small heels. Like I said, a huge part of my life. So, when I saw this picture, those long forgotten memories just came flooding back, ones I have not thought about for perhaps 25 some odd years. It took me back to a happy place. A very happy place. Every now and then we ALL must return to our happy place....wherever that may be! Just want to say I am new to the blog world, and am truly enjoying yours. I love Bermuda and only get to visit every now and then! So, thank you for the opportunity for me to feel like I'm sort-of there. - Karen M.
Karen M, Thanks for the visit and your comment. I'm glad you're enjoying the blog.